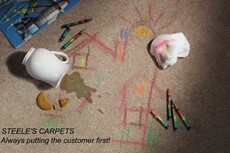 Take a look at Abingdon Carpets Stainfree Collection. Available in several different qualities to suit all pockets, this durable twist pile carpet is totally stain resistant. You can even clean it with bleach! Choose from a huge choice of colourways. This carpet is made in several different widths, thus eliminating excessive waste.